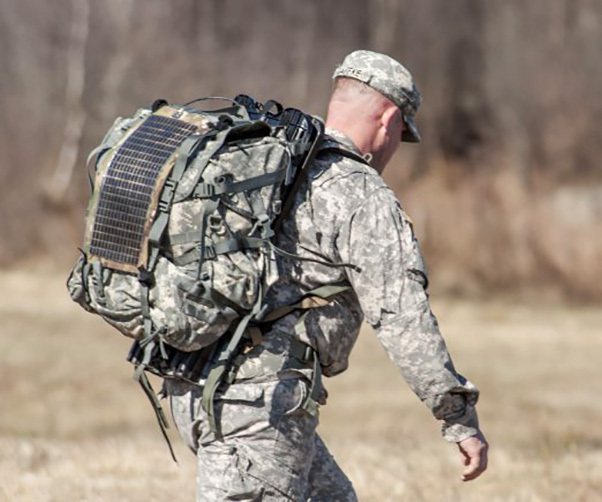 A Soldier tests a photovoltaic Solar Panel Harvester during an energy-harvesting technology demonstration at Fort Devens, Mass. Across all six of the Army’s modernization priorities — long-range precision fires, next generation combat vehicle, future vertical lift, network, air and missile defense, and Soldier lethality — there has been a dramatic increase in demand for power as a result of the introduction of new system capabilities and prototypes that are energy hungry, said an Army lead engineer. 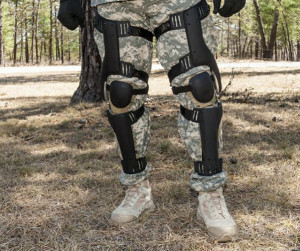 Of particular concern for Soldiers is the increase in energy demand in the areas of Soldier lethality, including augmented reality, said Julianne Douglas, Energy Harvesting Technology lead with the Army Communications-Electronics Research, Development and Engineering Center. Douglas spoke at a National Defense Industrial Association-sponsored Army Science & Technology Symposium and Showcase, Aug. 22. Increased energy demands will soon result in an increase in the quantity of batteries Soldiers must carry on dismounted patrols, Douglas said. 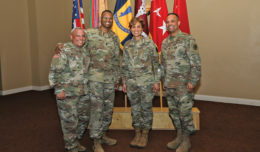 Based on her discussions with the Soldier Lethality Cross-Functional Team, which is in charge of overseeing the progress for that particular modernization priority, Douglas said a rifleman today requires an average of 12 watts of power in the form of AA and conformal wearable batteries. That means the weight requirement of batteries for a standard 72-hour patrol is about 15 pounds. That includes batteries for such things as night vision goggles, weapon optics and communications devices. 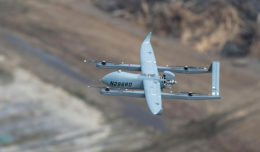 It doesn’t sound like much weight, but it adds to the other things Soldiers are hauling like weapons and ammunition, protective gear, and food and water, she said, adding that Soldiers are always trying to be better prepared, so their battery load for a 72-hour mission is probably closer to 25 pounds. A Soldier tests a kinetic knee harvester during an energy-harvesting technology demonstration at Fort Devens, Mass. All that added weight means Soldiers can get fatigued much more easily, are more susceptible to injury and are less able to maneuver nimbly, she noted. By 2025, the wattage and battery weight is expected to roughly double, she said, citing discussions with the Soldier Lethality Cross-Functional Team and Augmented Reality Cross-Functional Team. That estimate is based on anticipated power requirements of such gear as new augmented reality equipment and a next-generation squad weapon, she said. 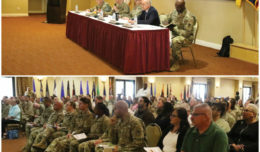 On top of that, discussions are taking place in the Army about the possibility of doubling the duration of the standard 72-hour patrol, said her colleague, Noel Soto, a systems engineer with Army Research, Development, and Engineering Command. It’s come to the point that Soldiers are losing their battlefield readiness as a result of all of the weight they carry and they are functioning more like “pack animals,” he said. Douglas said Army researchers are experimenting with ways to make batteries more powerful and last longer so fewer need to be carried. To do that, the researchers are trying to make batteries more energy dense by doing such things as replace graphite in batteries with carbon and fluorine gas, and in hybrid batteries use manganese dioxide. However, the high temperatures required for that process have made them prohibitively expensive, so the researchers are looking for ways to bring the cost down, even as they experiment with other chemicals, she said. 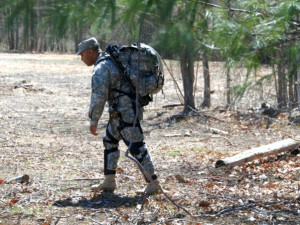 A Soldier tests a backpack frame kinetic harvester during an energy-harvesting technology demonstration at Fort Devens, Mass. Another solution would be to “add power consumption decision point to acquisition programs,” she said, noting that requirement is currently absent. The kinetic knee harvesters have received favorable reviews from Soldiers doing user testing, he said. They’re most efficient when Soldiers are moving downhill. The backpack frame kinetic harvesters are more efficient when Soldiers are going uphill, he said, as that’s when their rucksacks wobble the most. 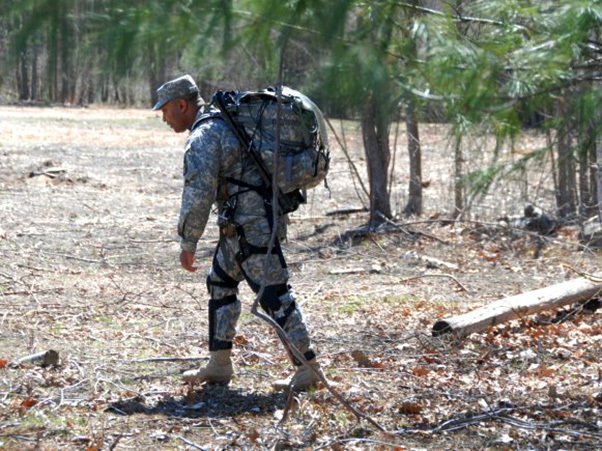 Soldiers are taught to tightly fasten everything down on their person, but in this case, having a loose-fitting rucksack results in more energy-harvesting efficiency. That doesn’t sit well with Soldiers, who prefer the kinetic knee harvesters. The added benefit of the kinetic knee harvesters is that when Soldiers go downhill, the mechanism helps Soldiers to more efficiently brake so they have a better-controlled descent and reduced fatigue, Soto added. Power produced by backpack frame kinetic harvesters varies, based on wobble, but it can be anywhere from 8 to 40 watts, he said. Kinetic knee harvesters produce about 6 watts going uphill and 30 watts downhill.